Central squares are changed in many cities. [..] Guides say: “There was a time when there was market!” But it is still here in Riga! In the centre. Where the Daugava is. Where the ancient walls are. At the place of ancient trading,” said the famous Latvian writer and journalist Eric Hanbergs in his book “Legendary Riga Central Market”. 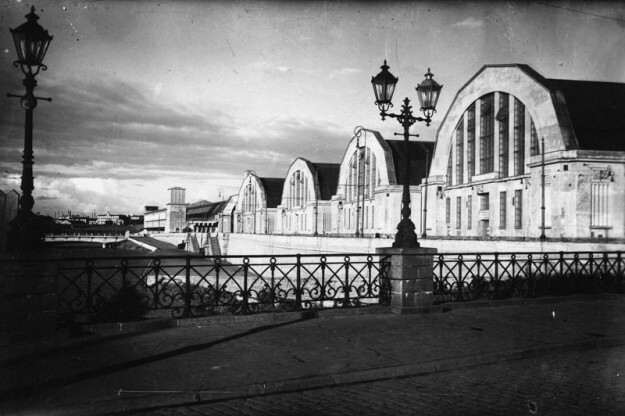 The need for the central market was debated in the City Council in 1909/1910, but World War I delayed those plans until 18 December, 1922, when Riga City Council decided to build the central food market. Works continued for eight years. 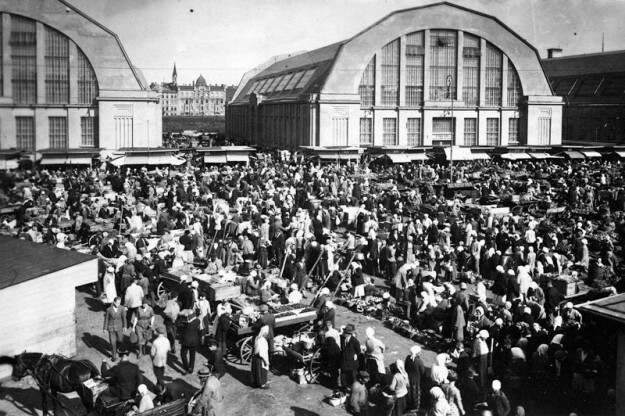 The previous city market was located nearby – by the Daugava, but it was too small and unsanitary for the growing city. The buildings used for the pavilions became an integral part of Riga’s unique features. Originally they were built in Vainode (Kurzeme) as German army aircraft – Zeppelin – hangars. The market’s “godfather” was Klavs Lawrence, Trade Department Manager of Riga City Council, because it was his decision to use the hangar iron constructions on the market’s newly constructed base. He wanted to use zeppelin hangars of the original size – 37.4 metres high, 47.2 metres wide and 240 metres long, but too big temperature fluctuations would have occurred because of their height and the equipment necessary for heating such huge buildings was not available. Therefore, it was decided to only use the upper part of the hangar and to build brick and reinforced concrete walls. Discussions and ideas about the appearance of Riga Central Market were intense and long. An international tender was announced but even the winning projects weren’t accepted for the final version. Good ideas were summed up and the bureau of the Market and Building and Construction Commission was established. Along with well-known architects and engineering students – prospective professionals were working there as well. Construction was started in June, 1924, but finished in the autumn of 1930. 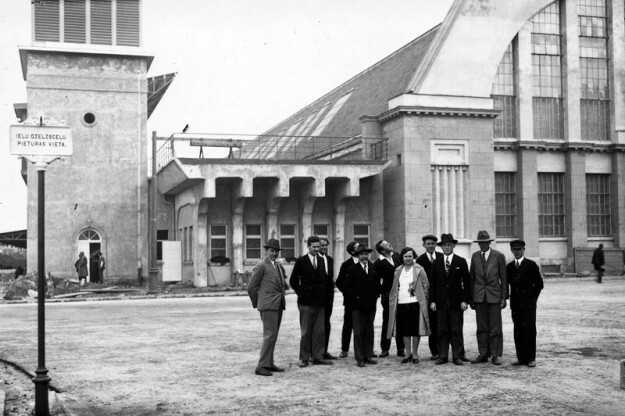 In 1924 large-scale works started but the plans did not fit in with the appropriated funds. The council couldn’t find funds after discussions and construction was stopped in 1926 and only resumed after two years. After adjustment, the pavilions were 20.5 m high and 35 m wide. 6 million bricks, 2 460 tons of iron and 60 thousand barrels of cement were used for these mighty constructions. It is estimated that the concrete, reinforced concrete and bricks used for the market constructions would be enough to build a wall 1.75 km long, 1 m thick and 20 m high. 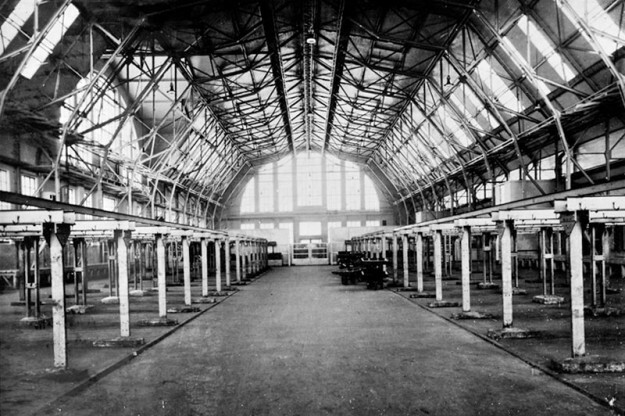 Central heating and electric lighting was installed in all the buildings of “Riga Central Market” even at the very beginning of exploitation – it was pretty modern for the time. In the basement under the pavilions concrete was laid – 2 hectares of underground town with main streets and lateral passages connected by a 337 m long passage. In 1938 there were 27 freezers able to accommodate up to 310 000 kg of goods. In 1961 during the Soviet period, the storage facilities could store up to 700 tonnes of products. 3 stock tunnels were connected with outlets near the channel. Cargo elevators were used to lift up the necessary goods. Some Nouveau architecture elements as well as pre-war neoclassical effects were used in the market project. Art-deco elements are used in some facades. 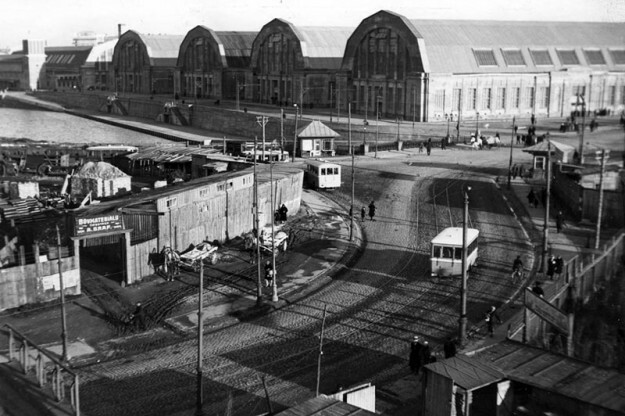 In the 1930s, Riga inhabitants could boast of the largest and most modern market in Europe. It was comfortable, bright, clean and neat. Farmers were glad to bring their products to Riga. 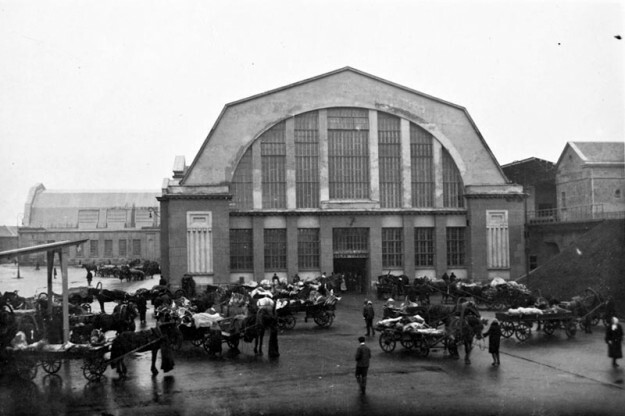 In 1931 “Riga Central Market” was recognised by foreign experts as not only the biggest, but also the best in Europe. Maids went shopping in Daugava Market, but the new big Riga Central Market was visited by hostesses themselves, often with their husbands. Sometimes the market was visited by statesmen and it was a popular excursion place for foreign visitors. The poor have always come here, but ministers and the rich – since 1930. 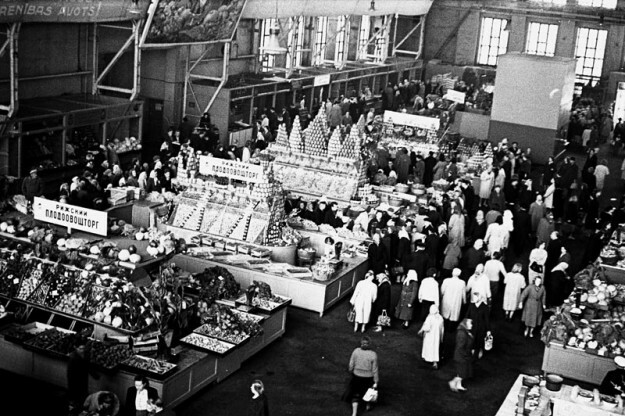 In 1949 the Central Market was renamed the Central Kolkhoz Market, the Soviet press praised it as the best market in the Soviet Union. In 1961, contracts for a regular supply of agricultural products to the market were concluded with 60 kolkhozes. Statistics show that 200 000 tonnes of meat, 768 000 litres of milk, about 7 million eggs, more than 9 thousand tonnes of potatoes, more than 8 thousand tonnes of vegetables and nearly 5,000 tonnes of fruit was sold in the market in 1961. The number of customers ranged from 50 to 70 thousand on weekdays, and reached 100 thousand on weekends and before holidays. In the 1980s functioning ammonia refrigeration plants of the market were replaced with Freon. The low-pressure steam heating system was replaced with a connection to the city’s central heating system. 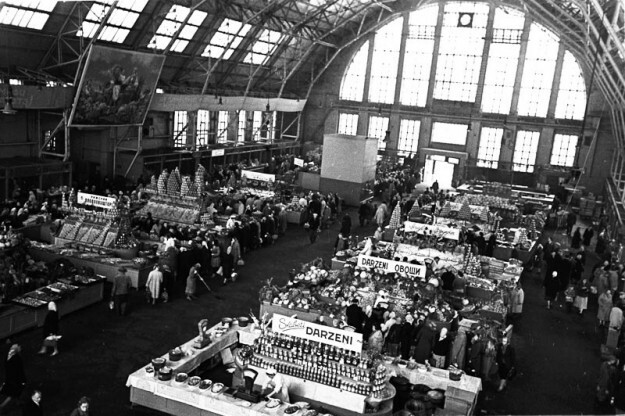 In 1997 the market was included in the UNESCO World Heritage list together with Old Riga. It survived the harsh realities of the rebirth of capitalism; Riga Central Market has found its place and been reborn, bringing together a variety of people. Here, in the centre of Riga, in the most colourful place which is admired by all guests, you can buy almost everything, but especially healthy, tasty, colourful and diverse Latvian countryside goods.